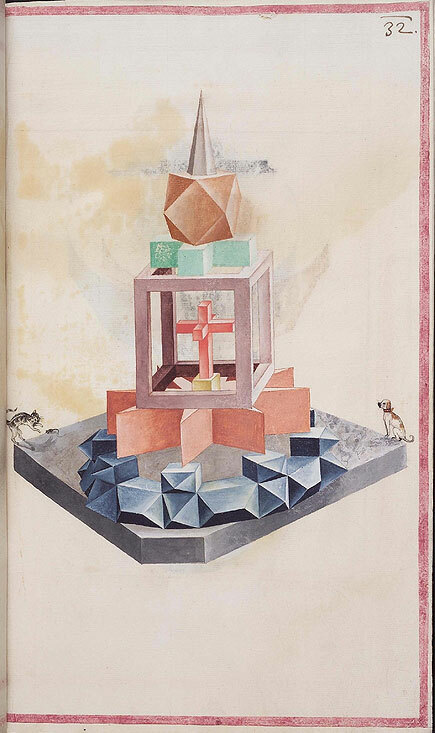 This curious image, shamelessly copied from Peacay’s excellent Bibliodyssey, is one of several similar images from a 36-page manuscript said to date from the sixteenth century. The provenance and attribution of this work are a bit mysterious. 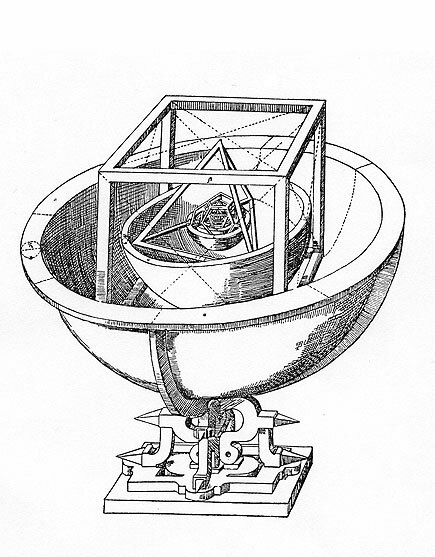 There was great interest in regular geometric solids during the sixteenth and seventeenth centuries, as it was thought that in them was hidden God’s secret design for the universe. Such thinking derived from the ancient lineage of Pythagoreanism. The image reproduced at Bibliodyssey is curious for its lack of context and its early date. As a philosophical/mathematical model it is much less rigorous than Kepler’s version and seems as much the result of private symbolism as of mathematics. Some of the images from the manuscript have something of the quality of origami, which is certainly out of the mainstream even of esoterica, so to speak. I would hazard the guess that the author of this work might have been a forerunner of Rosicrucianism (notice the three-dimensional cross in the center of the image, which has some of the vocabulary of alchemy). If I can learn more about the manuscript I will share what I find out. Today is Friday, April 19, 2019 4:51 am (U.S. central time).